I also had to explain how to complete the carnet at the Thai border. No-one asked for it but as we were about to leave one official realised that the van had not been officially signed in. Just as well otherwise we would have had the van in the country illegally. I had expected to go up the west coast but the roads from the border did not go that way so we ended up on the east coast. At first we could see little difference between the two countries but slowly we noticed the details. Firstly very few women have head scarves (so where are all these Muslims agitating for an autonomous region? ); motorbike riders wear helmets; women passengers sometimes sit side saddle; the pictures of the king are less rigidly formal , although there are formal ones as well he is also shown with a camera or looking at a farming project; there are many more pictures of the king most taken in his younger days: the script is totally new to us and the English version is very small so I had to be on the lookout the whole time; there are motorbikes with trailer type sidecars used as taxis and as general transport; bakkies (utes, pickups) are used as taxis; there are many Buddhist Temples and very few mosques; there are many shrines and spirit houses for sale, some are really gorgeous: businesses have spirit houses from small to elaborate. Apparently a Brahmin or Buddhist monk is asked to come and decide where the spirit house should be placed. Each piece of land is thought to have a spirit. To keep them happy and out of the main house a spirit house is needed. Offerings of food, drink and flowers are made daily. What is similar? The cultural mix; the ubiquitous 7/11 store: good roads with modern cars and plenty of motorbikes: fancy street lights in some of the towns; potted and trimmed gardens. The people became more homogeneous once we reached Bangkok. 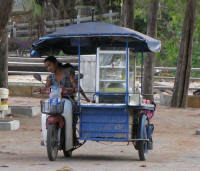 Once we reached Songkhla we headed straight for Somila Beach and parked in one of the many parking areas. There is quite a strong wind from the Gulf of Thailand, unlike in the west on the Andaman Sea where the wind is more gentle. Songkhla was our first look at Thai Buddhist Temples. 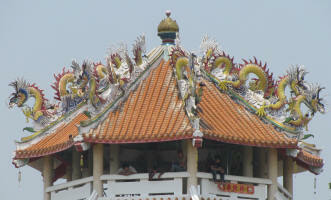 The majority have a 3 tiered roofline for the teacher (Buddha), the teaching (dharma) and the followers. Kai, a Thai with excellent English, came by and talked about travelling. He invited us for a meal that evening. First we went to his house for beer. The house takes up most of the property but is very cool with many windows and doors all with netting to keep out the mosquitoes. He offered us a bed for the night however we prefer to sleep in our own bed, but we did take him up on the offer of a shower. Then we went to a restaurant with his wife and 2 young sons. The food was fabulous, prawns, fish, pork, some spicy some not. It was a fabulous evening. The next morning he brought us sticky rice for breakfast. This is spicy fish paste moulded into a tube of cooked sticky rice wrapped in a leaf and bar-b-qued like a kebab. Once again delicious. I could have this for breakfast every morning. Pieter wanted some wine to go with the fish braai (bar-b-que) planned for that evening. Kai gave us directions but we missed the store. 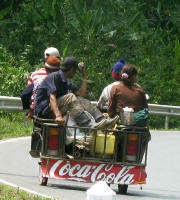 Eventually a beer wholesaler led us there on his motor bike. Except he also did not quite know where it was. We set off on foot to look around but our guide indicated we should get on his bike - both of us. Interesting to be 3 on a bike but it is done all the time in the east. The shop was actually just around the corner. That evening we had the fish braai on the beach. Unfortunately the tide was in so Kai had to fetch his braai. The wind also made the charcoal burn very quickly. The fish was good though as was the duck he had brought along. The boys enjoyed the beach but were taken home early as they had had such a late night the evening before. Thanks Kai for a great time. 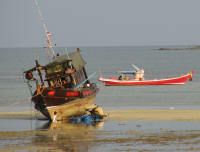 We wanted to go up the west coast to Krabi and Phuket and headed off across the peninsula. There are many plantations. I did not realise what they were at first but noticed all the trees seemed to have one black round growth on them. Then we came close enough and I could see the cuts in the tree trunk - rubber trees obviously. There are also plenty of oil palm plantations, waterfalls and caves. We did not explore any of the waterfalls or caves though, who knows they may have been spectacular but the hills are not very high. We missed the main turnoff to Trang and ended up on a minor road along the coast. It was getting late as we left quite late and decided to stop at the next beach. This ended up being a small beautiful beach with no-one there. A family arrived later on and set up a tent for the night but it was so peaceful, just the place to chill out for days - if you have the supplies of water and food! I specifically wanted to go snorkelling. At Krabi I asked about trips and discovered they all went from Ao Nang. Although the price included the trip from Krabi to Ao Nang we decided to rather go to Ao Nang. This is a typical tourist place with many tours on offer. We parked on a plot that was being readied for development and set off to explore the small town. I booked a trip with a pick up at the office and also put the washing in at a laundry service. Our only problem was the noise from the nearby bar but we survived until closing time. The following night we moved down the dirt road to a lovely quiet spot with toilets and a tap with a short hose, just long enough to have a shower with after a day of swimming in the sea. I went to the Phi Phi Islands on a speed boat rather than the older boats with no shade. We had an English speaking guide whose name I did not catch. The journey itself was rather like a ride in a fairground. The speed boat went very fast at times smashing across the wakes of other speed boats. Great fun. First stop was Bamboo Island for some swimming and a little bit of snorkelling although there was not much to see. The most impressive sight was the beautiful colours of the water which are always so difficult to capture on film. Next we headed for Phi Phi Lay Island passing the Viking cave. This has drawings of ships that look rather like Viking ships hence the name. It is also the source of birds' nests used in birds nest soup, hence we could not stop and explore, just take photos. The are guards living at the entrance to the cave. This was followed by Phi Phi Lagoon, just in and out, then Maya Bay where 'The Beach' was filmed. There was not much to do here. There was an area demarcated for swimming but most of the shore area was taken up by the boats, very colourful with their banners and ribbons on the prow. Phi Phi Don Island was our lunch stop. Lot's of great Thai food plus Spaghetti Bolognaise for confirmed westerners. I shared the table with honeymooners and 4 Malaysian girls on holiday. The town is very touristy with souvenir stands, restaurants, hotels and dive schools. Having spoken to qualified dive instructors I would not go with any of the schools. They all had the same approach. Half day to try it out which included 2 dives, the first within an hour. Three days for full qualification as a diver. Over 40 and therefore should have a medical? No problem they will phone the doctor (maybe) who will give the go ahead without any personal contact. What sort of instruction would they give? Not very good that is for sure. The Malaysian girls agreed when I told them this as one was a qualified diver and another was in the process of qualifying. After lunch the serious business of snorkelling began. First back to Phi Phi Lay Island and Monkey Beach for some inshore snorkelling. I wish I had an underwater camera! One couple had a compact one and took some good photos. Needless to say it was a great experience to see the various fish - yellow angel fish, a blue fish with a yellow stripe in the fins and pink on the tail, grey angel fish and many more I did not recognize. Having a life jacket made it much easier to just lie face down in the water and watch. Last stop was Hin Klang off Phi Phi Don Island for some offshore snorkelling this time over a coral reef. Most of the reef was brown (alive though as you could see the white tips of the live coral). There were some bright yellow and blue corals. The fish were different, some much larger. I did see some small jelly fish hanging in the water. I was also given some bread to hold in a closed fist and feed it slowly to the fish. They are in such a frenzy to get to it that there are thousands of small fish all going for the hand. They nip as well although it is not painful. I was so engrossed in just floating that I lost track of my boat. I had actually drifted about 100 meters away. When I looked around all I could see on the surface were speed boats. It didn't take long to figure out which direction to head and I did find the boat. I winder what they would have done if I had not found them? Not only was the water covered in speed boats it was also covered in floating bodies. Once again it was time to rest. We are no longer rushing as we did in Africa. There are lots of beaches but we chose the first one past Phuket town. It was quiet, near a food court and had shade. The beach itself was not much. It was very shallow and somewhat muddy. All along the west coast there are tsunami danger warnings and evacuation routes. I hope they help in the event of another tsunami but the idea of running 300m before you can even start to get away doesn't give you much chance. The next one was 600 meters from the sign! We headed up the west coast of Phuket Island. It has hills going down to the sea and beaches between the headlands. Definitely a tourist paradise where money can be spent like water on food, drink, elephant rides, snorkelling, diving and if your a man with money nice young Thai women. We stopped at Khao Sok National Park. According to the LP it is supposed to be cooler here as it is in the hills, if only that were true. It was cooler at night, I had to use a sheet again. Most of the park is inaccessible but there are some walking trails of up to 7 kilometres long. We decided to only go as far as 'Wang Yao' a pool about 3 kilometres in, making a total walk of about 7 kilometres. That is enough for out of condition people. We passed the Wing Hin Waterfall and the Bang Hua Raet Waterfall on the way. The Wing Hin Waterfall was just water going over rocks. The Bang Hua Raet Waterfall is described as a large 2 tiered waterfall. This is a VERY loose definition of a waterfall. Based on photographs some of the ones further out would pass my definition of a waterfall but not the ones we saw. The pool was refreshing. It was a pleasant walk with a lot of shade provided by Bamboo and other trees. The park itself covers 738 square kilometres over a limestone range (kast mountains similar to Guilin inChina). There are many species of animal, bird (155 species) and plant life including Rafflesi, the largest and smelliest flower on earth. It appears to be the flowering season as this was not the first opportunity to see the flower. However you have to go on a tour with a guide or accept the possibility of not finding one and getting lost. There is nothing much to say about the drive to Bangkok. It is about 700 kilometres. The roads are patched but they are being re-tarred in places. It will be good when this is finished. The first night we stayed on a beach near Chumphon (N 10˚ 33.742 E˚ 099˚ 16.426). The second night we headed to Samut Songkhram which on the map looked as if it might have a nice beach where we could stay 2 nights to rest and catch up on the household chores before going into Bangkok. No such luck. The "beach" was mud lined with restaurants so we headed back south to Petchaburi and Ban Laem. Ban Laem is a town that seems to consist of 90% Wats and 10% houses! We were told the beach was over a bridge and 2 right hand turns away. Off we went over the narrow bridge only to find a heavy cross pole on the other side which was too low for the van! Reversing over a narrow bridge while motor bikes keep on trying to pass and cars have to also reverse to let us over is NOT a relaxing experience. Needless to say we parked with the food stalls for the night where it was quite noisy and left for Bangkok the next day. The chores would have to wait. Near Bangkok we found a Tesco where we could actually park half under cover. Like other Tescoes you receive an entry card which is handed back on exit. Parking though is free. We asked if we could park there for a few days, the idea being to take public transport into Bangkok. Unfortunately the answer was no. After buying supplies including a small piece of Durian we went on. Durian is a local fruit delicacy. 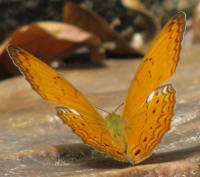 It has large spines all over the surface of the skin and pale flesh. 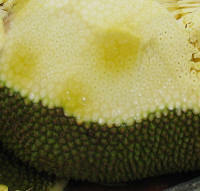 Jack Fruit is similar but the spines less prominent and the flesh more yellow. I had eaten Jack Fruit in Zanzibar and was keen to try the Durian. I could not figure out where we were on the map of Bangkok and after an hour or so Pieter stopped the van and I asked at a bus stop for some-one who could speak English. She was able to show me exactly where we were. This was fairly close to a stadium and we felt there might be parking there so Pieter moved into the traffic which went slowly forward, a few cars each traffic light. The time between green lights became longer and longer. It was then I noticed that on a board overhead one of the lines had changed from red to orange. On closer inspection it became obvious that this was a map of the streets ahead and we were in a gridlock. The best option was to to turn left at the next street - as soon as the light turned green. This was obviously going to take some time as cars were turning into our street from the street on the left and taking up all the available space. Taxi drivers were losing business. All the passengers eventually got out and walked. I was surprised when 2 young girls got in to a taxi, but after 20 minutes of being stationary they also got out and walked. We had lots of time to watch a squirrel going into the park on our right over the power lines and then scurrying back again many times. It must have been gathering food. And you thought power lines were only to transport electricity and provide perches for birds! Eventually, after 1.5 hours, we got the green light and along with a dozen other cars turned left. When we turned into the street where I thought the stadium was it turned out I had directed us to a street too soon. But cars were entering a complex on the left so we did too and asked the guard if we could sleep there the night. He was agreeable so we parked, ate some noodles as it was very late and I had some of the Durian. It does not have very much taste at all, certainly not as much as Jack Fruit. I also found it to be much better than any laxative. I spent the night sleeping on the seat with my feet on the bucket full of washing. I leave the rest to your imagination. The smell of the Durian became too much for me so I chucked it out the window. A dog came by during the night and I assumed that was the end of the Durian. Not so, in the morning I found it had not even been touched! Dogs obviously have more sense than I. Next morning we were woken early by the guards to say we were in the Dean's parking place and could we please move. I explained we needed to go to the Dutch Embassy and did they know where it was. They went off, found it on a map and were able to tell us exactly how to get there. I still managed to get us a little lost but we eventually found the front entrance only to be told to go around to the back entrance. We found that quite easily but where to park the car? The road was narrow and parking difficult. Eventually Pieter just parked in front to a business. He later moved the van back a bit so it was not in front of the business but of a house. Cars just had to go around it. None of the Dutch clients at the Embassy had a good word to say about the service. All we needed was a signature and a stamp on a "Proof of Life" document plus some questions ticked so Pieter would continue to receive his pension. Still we had to wait in queue with others who needed much more complex attention. The form when it finally came back was not filled in correctly but it did have the signature and stamp. Just hope that is good enough! Two nights of poor sleep with 3 days of travel and all the aggravation meant it was time to find somewhere relaxing for a few days, obviously out of Bangkok. We drove until we found a decent place to stop. This was a lovely paved communal area where people came to relax. First intimation that it may not be all it promised was the arrival of a bakkie (ute, pickup) right next to us with lots of youngsters, lots of alcohol and a huge boom box. Eventually it became too much and we decided to move. However the youngsters took the hint and moved off. The next two came after we were in bed. They parked quite a distance away on either side of us and competed! The whole van shook. We were both tired and it took quite some time for irritation to rise above fatigue. By 12:30am I had had enough and because Pieter was not really awake I decided to at least go for a walk away from the noise. Within 2 minutes I found a spot on the other side of a large rock where you could not hear the noise. That made my decision for me and with Pieter protesting a little I moved us to the lovely quiet place. We were hardly even disturbed the following morning by stall holders setting up their umbrellas, tables and stalls right next to us. The washing was done, the van cleaned and a lot of time spent relaxing. Bliss! Today was a day for sightseeing and finding a spot near Bangkok for the night. First stop was the Naja Wat near Chonburi. It is magnificent and recently renovated. There is so much detail it is overwhelming. The photos say it all. The souvenir stalls sold many statues. Phra Maha That is one of the most important monasteries in southern Thailand. There are several stupas reconstructed from the monastery. The Stupa of Phra Maha That, Chaiya, Surat Thani is a reconstruction of the most ancient form of a Chedi found in Java. The central tower is a round chedi serving as the upper story of a relic chamber. Kirti Mukha mask motifs are above the chamber. The stupa of Phra Maha That, Ratchaburi (left) is reconstructed from the one in Ratchaburi built between the 11th and 13th centuries. It represents Mahayana Buddhism as practiced by the Tibetans. The image of Buddha with its Gandhara (Greek) hair style is from the Dvaravati Kingdom which prospered between the 12th and 16th centuries. The statue is in the sitting or teaching position. The Gandhara style was started in Pakistan at Taxila near Islamabad based on the hair styles of Alexander the Great and his army. The ancient Theatrical Pavilion was built during the Ayutthaya Kingdom (1350 to 1765). I caught the last part of the last dance put on especially for a large group of school children. The dancing was very slow and controlled. The children seemed bored and quickly ran off to their busses as soon as the dance was finished. Pink, by the way is a favourite colour for all Thais both male and female. Pieter has declined to buy one. The garden of Pha Daeng-Nang Ai is a creative design. Nang Ai the most beautiful girl in Khomkhan City had secret trysts with Pha Daeng the ruler of Phaphong. Her beauty was eventually discovered by the Naga Prince but he did not succeed in winning her heart. Finally he decided to trick her by disguising himself as a white squirrel in order to get close to her and kidnap her from Pha Daeng. The white squirrel was killed and the meat fed to the people of the town. Then a huge rainstorm deluged the town. The couple tried to escape but Nang Ai fell from the horse and was pulled into the river. The dead squrrel turned into the King of Naga and he took Nang Ai into his watery kingdom. The town became a vast pool. So I guess everyone paid the price of Nang Ai not liking the Naga King. 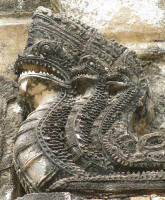 The two 7 headed serpents represent Naga, a mythical serpent. The Phra That Bang Phuan, Nong Khai is a duplicate of the original situated at Don Mu inNong Khai. It is believed to hold the relics of Lord Buddha brought from India. It has many heads made from shards of pottery. The Folk Museum is nearby. 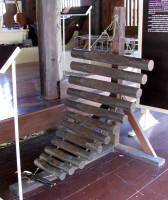 It houses many farming and fishing implements as well as musical instruments and crafts. 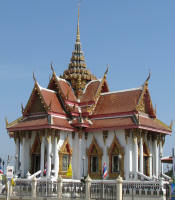 Ho Kham, Lampang (reconstructed) was used as an official residence by the Governor of Lampang. It is securely built without the use of a single nail. The Great Battle of Yuthahathi is another creative design. The Ayutthaya Kingdom of Siam fell to Burma in 1569. In May 1584 King Naresuan declared Siam independence from Burma. The great battle of Yuthahathi ensued at Nong Sarai. Elephants were used. An ancient Thai Junk (creative design) is moored on one of the lakes. Compared to 15th and 16th century European sailing ships it is large with 3covered pavilions on board. Of course in recent years it has become acknowledged that the Asians were way ahead of Europeans when it came to sailing. Junks disappeared about 50 years ago. The junk was being used as a backdrop for wedding photos just like the beach in Penang, Malaysia. The late Ayutthaya period (1350 to 1765) was an economic powerhouse in the region. Royal Barges adapted from war ships were used on many state occasions. They also represented the importance of the waterways in Thailand. The barges on display have been reconstructed based on the real barges. There were 16 on display. Eventually we set off to find a stop over for the night. Nothing went according to plan. I managed to get us on the wrong road, we got caught in traffic and could not get on the highway where we knew there was a rest area. Eventually we ended way out of town at a garage north east of Bangkok. It does not help that the city rail lines are being extended and new expressways built. The signs do not always have English translations either. At least there was a hose near by and we could fill up with washing water. Drinking water must be purchased. Pieter even used the hose to have a shower. I had a bush bath over the squat toilet, that was lovely, just to have water poured over my body instead of using a cloth and basin of water. The traffic noise was not too bad either. The idea was to head for Banglamphu where other overlanders had parked 3 years before. We stopped at a Tesco so I could ask where we were. Not only did we find some-one with good English, she could also read maps and knew exactly where we were. It was easy to plot a route from there. This time we didn't do too badly and only made 1 mistake in getting onto the main road we wanted. It ended up actually being a diversion through heavy traffic instead of an easy drive on the highway. Still I guess we saved on the toll. Naturally we then found the plotted route had 1 way streets on it and we had to change direction and find our way around through other streets. Not easy for the navigator (me) as I had to figure out a new route while traveling along nor for the driver (Pieter) as my uncertainty frustrated him. Eventually we arrived in the correct area but there was very little parking. The streets were lined with stalls and overhead wires which luckily we just fitted under. We did find a spot on Soi Ram Buttri near Thanon Chao away from the stalls. Our detailed map of Bangkok was absolutely essential. Finding a hotel was reasonably simple. Every second building is a hotel or guest house. Prices and facilities varied and some were full. One hotel showed us a room but by the time Pieter returned to reception after inspecting it the room had been taken by an e-mail booking from a past guest! We ended up in a more expensive hotel, O'Bangkok, but there is air conditioning, a fan, an en-suite bathroom and full English breakfast included. Anyway we can afford a bit of luxury since we have not yet paid for accommodation in Thailand. I spent Sunday in bed with my foot up. When I had asked for directions at Tesco I had twisted my ankle but it seemed fine. By the time we were looking for a hotel it was painful. At least I managed to work on the website in a cool room with lots of electricity. Taxis come in many different colours although pink seems to predominate. There are plain pink, pink with either yellow, white brown or blue stripes, dark pink, white or dark pink bottom with light pink top, green bottom with yellow or pink top, red bottom with blue or yellow top, orange bottom with yellow top, red, orange, purple, light green or blue taxis. Plus many other combinations. The buses were also very colourful but with fewer combinations. It makes the streets of Bangkok a colourful sight. We used both taxis and tuck-tucks to get around. This is much easier than trying to find our way through all the one way streets both small and large. Unfortunately our map does not show the direction of the traffic flow nor where there are barriers to turning left or right. We went by ferry to the Grand Palace. When we arrived we were waylaid by a tuck-tuck driver who said he would take us to 4 different places for a small charge. The first stop was the Golden Buddha so we agreed. The Buddha is in Wat Traimit. It is solid gold, 3 metres tall and weighs 5.5 tonnes. It was once covered in stucco but during an attempt to move it in the 1960s it fell, the stucco cracked and the treasure inside revealed. The stucco was presumably to prevent it being taken during one of the many Burmese invasions. Next stop was a tailor shop. The driver insisted we went in so we did under protest. The next stop was another shop this time we refused to go in. He wanted us to go in and stay for 10 minutes so he could collect a bonus. Pieter was very annoyed and paid him off. The driver was not at all happy. We had to get another tuck tuck back to the palace which cost twice as much. No more cheap deals for us! The Grand Palace was simply overwhelming. The exuberance and extravagance of colour using paint, gold leaf, mirrors and tiles with all the intricate detail on the buildings built close together is impossible to take in. There is just so much. The LP had said you needed to be covered from elbow to knee and wear closed shoes. I wore 3/4 length pants a long sleeved top and socks with sandals. The problem was the pants. If a women has a skirt covering her knees it is OK but pants must be long. Men must also wear long pants. Short sleeves are OK. I did not really notice the footwear. I had to use a skirt provided by management. I saw several males with really bright pants, I guess these were also provided by management. Shirts were also available. I had wrapped the skirt over my pants but within a few minutes realised this would be far too hot. At least it is easy to discreetly remove pants from under a long skirt. The two main attractions are the Temple of the Emerald Buddha and a series of halls used for various state purposes at some stage including coronations. But there is just so much else around each of these buildings that it is mind boggling. The complex was established in 1782 by King Rama l. It covers an area of 218,000 square metres with walls 1,900 metres long. The Emerald Buddha is enshrined on a golden traditional Thai style throne made of gilded carved wood known as a Busabok. The image is clad in the appropriate seasonal (summer, rainy and winter) costume. The Buddha is carved from a block of green jade. It was discovered in a stupa in Chiang Rai in 1434 covered in stucco. The abbot noticed that some of the stucco had come of and thought the Buddha was made of jade. The Buddha is so high up it looks quite small but it must be reasonably large. The decorative detail on the outside and inside is magnificent. The upper terrace has 3 main monuments, a chedi, the Mondop a repository of Buddhist scriptures and the Royal Pantheon with statues of past kings. Scattered around the terrace are statues of elephants and mythical beings. The Phra Maha Monthian group of buildings consists of the coronation hall, various other halls and the original royal residence. Wednesday morning I visited the National Museum before we left Bangkok. There is a free English language tour on both Wednesday and Thursday. Unfortunately no photos are allowed so I only have some of the outside of one of the buildings showing a Garuda, a Chaw Fa in the form of a stylized Garuda and a stylized Naga Serpent along the roof line. 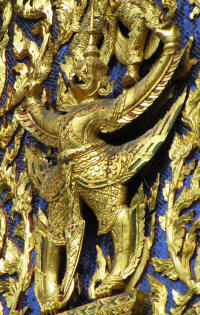 The Garuda is the chariot of one of the Hindu gods and is only used on royal buildings. 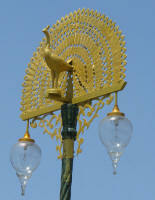 It is a symbol of the sky and the Royal Family. The guide is a volunteer and took us on a quick 2 hour tour of the most important exhibits that were not clearly marked in English. The museum seems to consist of many items related to Buddhism and some relating to the Royal Family. She also gave a quick sketch of historical influences on Thai culture starting with the Vedas developed by the people of the Indus Valley in 3,500 BC, through the gradual spread of Hinduism through trade with India. The Indians were dependant on the trade winds and ended up with permanent settlements on the coast of Thailand and Myanmar. Buddhism spread in a similar manner. Then there were Kingdoms developed in Myanmar that had empires extending into Thailand, the Khmer from Cambodia and Thai Kingdoms that spread into both of these countries. 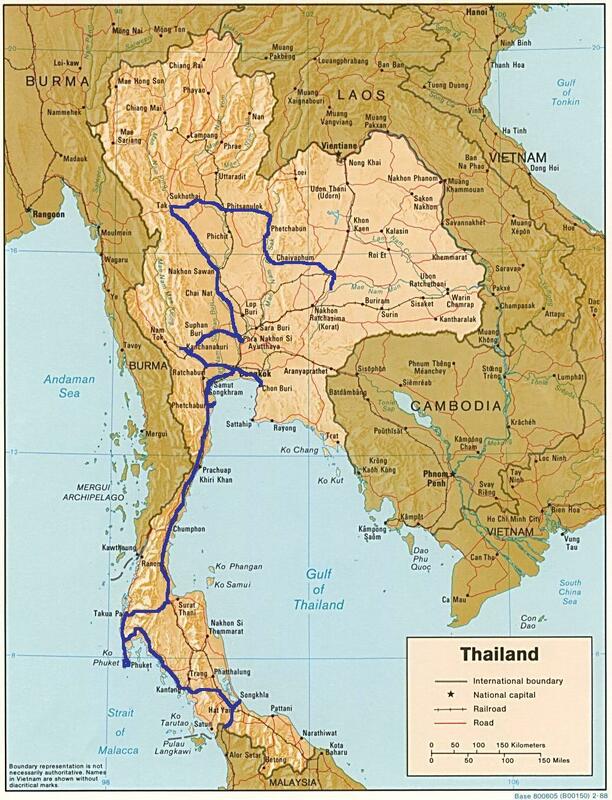 Cambodia was also on the main trade route between China and India. 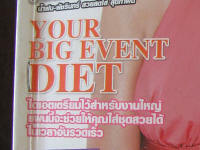 Hence Thai culture is an amalgamation of all these influences. There seems to be a lot of Hinduism in Theravada Buddhism. Such as representation of Mt. Meru where the (Hindu) gods live. The main premise of the religion is that death brings extinction although there is reincarnation. Buddha also seems to have performed many miracles. If you want to know more about the religion please do not quote me! I found it interesting but there is so much information it is impossible to digest. Kanchanaburi is the sight of the Bridge over the River Kwai. There is not much to see but there is the sentiment. The bridge has been rebuilt and is still in use. There is a memorial to the Allied Forces and other people who lost their lives building the Death Railway. It was built by the Japanese in 1944. I cannot believe this. That they built a memorial for the completion of the railway - yes. But at the time they considered soldiers who did not fight to the death to be beneath contempt. It seems unlikely they would have built a memorial to a group for which they had no respect at all. A case of history being rewritten because of a change in the attitude of the Japanese? The King was born in 1927 and came to the throne in 1948 at the age of 19. His mother was a commoner and he did not expect to become king. However their were no other heirs. He is now 81 but most photos show a much younger man. His photos are everywhere with the yellow flag of Buddhism and the Thai flag. There is usually a gold pot or decoration on the left (for gold) and a silver one on the right (for money). Since he is the richest monarch in the world perhaps these symbols work! This photo has all these ingredients. It also has a fish on each side of the bottom of the frame with a Garuda in the centre. The fish is the symbol of Kanchaburi (and many other areas). On the way to Ayuthaya we saw a Dragon Park at Suphan Buri. It looked very kitsch so we did not go in but just took some photos. We decided to stop early on a spot in the country away from the road as we never know what we will find in town. Ayutthaya was the capital of Thailand from 1350 to 1767 when the Burmese captured and destroyed the city. The capital was then moved to Thonburi in modern day Bangkok. Ayutthaya is named after the home of Rama in the Indian epic the Ramayana. It has many old ruins of many different styles because of its long history as the capital. We first went to the Historical Study Centre which gave us an excellent idea of how the capital must have looked in its heyday. We spent the night near the monument of King Naresuan the Great. We found a lovely spot under some trees but were moved by the police to another spot much further away from the monument, Chedi and Wat. It was far enough away from the highway to be quiet. The monument is to King Naresuan the Great. Unfortunately there is no indication in English as to why he is considered great. Presumably because he led the people to victory in a war. Throughout the history of Ayuttaya there were many attacks by the Burmese and other potential conquerors. His symbol seems to be the Rooster. There are roosters all around the monument in row after row, as well as on the road in. The Pagoda Phu Khao Thong (Golden Mountain) behind monument. The base is in the Burmese-Mon style (solid and heavy), the top was altered sometime after 1569 and is a rabbeted 12 angled pagoda (no I am not sure what that means). On the way into town, which is built on and around the ancient city, you can buy your statue of Buddha in various positions, other gods or a rooster. You can also have an elephant ride around the Grand Palace. The Grand Palace basically has 3 Chedi of Wat Phra Si Sanphet, built in the mid 15th century, still in place. The rest are ruins except for two restored Pavilions. Not really worth the entrance fee. One of the largest bronze Buddha images in Thailand (9.55m wide x 12.45m high without the base) is housed in the Vihara (hall) of Phra Mongkhon Bophit at the entrance to the Grand Palace complex. Like many sitting images of Buddha it has the right hand pointing down subduing Mara. Mara or 'Loed of the Senses' temped Buddha on several occasions both before and after his enlightenment. The downward hand signifies Buddha asking the earth to witness his charities so Mara would be subdued. It was built in the early Ayutthaya period between 1448 and 1602. We took photos of Prang at Wat Phra Ram and Wat Ratchaburana from outside. 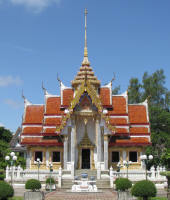 Wat Phra Ram was built by King Ramesuan on the ground where his father King Uthon was cremated. Wat Ratchaburana has the largest vault found in Ayutthaya. It and another prang were built on the ground where Chao Ai and Chao Yi engaged in single handed combat on elephant back and both were killed. Dates were not included in the info. With the state of the Rand, Thai entrance fees become expensive. We decided to head north. A normal travelling day. We saw many models of fish along the highway. We spent the night on private property. Pieter saw what he took to be a small shop on the southbound side of the highway. We did a U-turn and drove up to it and then realised it was actually a shack/house. The owner gave us permission to stay the night. Even though the highway was busy the noise was muted and we both had a good night's sleep. It was still cool as well which helped. We had plenty of washing water so I managed to catch up on that chore. Next morning I also cut my hair and washed it. It was getting far too long. When we reach Tak we had to decide which direction to go, west, north or south to Cambodia. We had been warned that the north was very dry with many bush fires. We could see the evidence for ourselves by now. The choice was south. 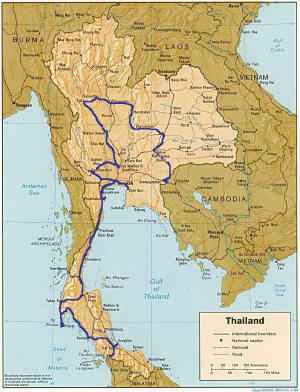 We will head for Cambodia and then go up through Laos to the Chinese border. We arrived late in the afternoon and only saw the Sukhothai Historical Park the next morning. Wat Mahathat is the most extensive of the various Wats in the park. It once contained 198 chedi with various chapels, sanctuaries and statues of Buddha. 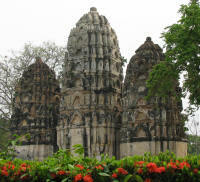 The architecture is typical of Sukhothai. The Chedi are usually on a 3 tiered base followed by a square structure and a conical spire topped with a lotus bud stupa. Wat Sa Si sits in the middle of a large reservoir. It consists of a bell shaped chedi, a vihara (assembly hall) with a statue of Buddha and an ordination hall on a smaller island. It was typical to have the ordination hall separated from the main buildings and surrounded by water as a symbol of purity. 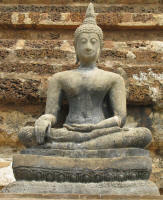 The bell shaped chedi shows that Sinhalese Buddhism was prevalent in Sukhothai. The columns of the vihara are made from laterite rock covered with stucco. The walking Buddha shows a definite Indian style, presumably part of the Sinhalese sculptural tradition. In this style the body shows a S shape seen front on and the Buddha seems quite feminine. Wat Sri Sawai has 3 Khmer style Praang with a moat. 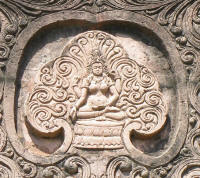 The images on the praang indicate that this was a Hindu temple retrofitted to a Buddhist Monastery. The praangs imitate Hindu Shikhara Vimanas. They are built in Lop Buri style. Some of the designs are similar to those of the Chinese Yuan dynasty. The road ran through hills where there were lots of waterfalls. We did not go and see any though as we are sceptical about their size. I did see one through the trees. It must have been at least 10 meters high so maybe they might have been worth visiting. The road side had experienced many fires and the ground was very dry with quite a few dead trees. Still the hills were a pleasant change. It is still relatively cool and we have even had a rain storm. I finally managed to take a photo of a multi coloured bougainvillea. Several colours are grafted onto one stem - very popular in Thailand. Information for overlanders we stayed at the roadside of Highway 12 (N 16˚ 52.687 E 100˚ 38.348), a Petrol Station in a town on Highway 21 (N˚ 16 15.719 E˚101 02.938) and at the roadside of Highway 2 (N 15˚ 24.021 E 102˚ 28.435). Before heading to the second largest city in Thailand we visited the Phimai Historical Park. The city was built in the 11th to 12th century CE with the main hall facing south east towards Angkor the then capital of the Khmer Empire. 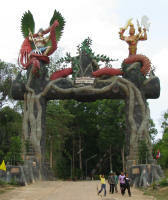 The site starts with the Naga Bridge adorned with 2 lions and Naga serpent heads denoting the crossing from the earthly to the heavenly realms. Then through an archway in the wall surrounding the inner area. The buildings have a laterite base with pink sandstone. Some of the decoration is done in stucco as it lasts longer than sandstone. In Nakhon Ratchasima they were preparing for the annual festival for Khun Ying Mo. She rallied the local inhabitants against an invasion by Laotian forces during the reign of Rama lll (1824-1851). He later gave her a title of Thao Suranari. The memorial is considered a shrine with people praying and offering gifts. The festival included dancers. We spent our time relaxing in a cool room. We found a lovely spot to spend the night by a small lake. We ate a fruit I had not seen before, a Tub Lim Jan Rose Apple. It is crisp and juicy but has little taste. I have included part of a magazine cover. We have been looking for English reading material since Bangkok and the first few times I saw a magazine I thought it was in English as the titles were in English. Unfortunately the copy is all in Thai.